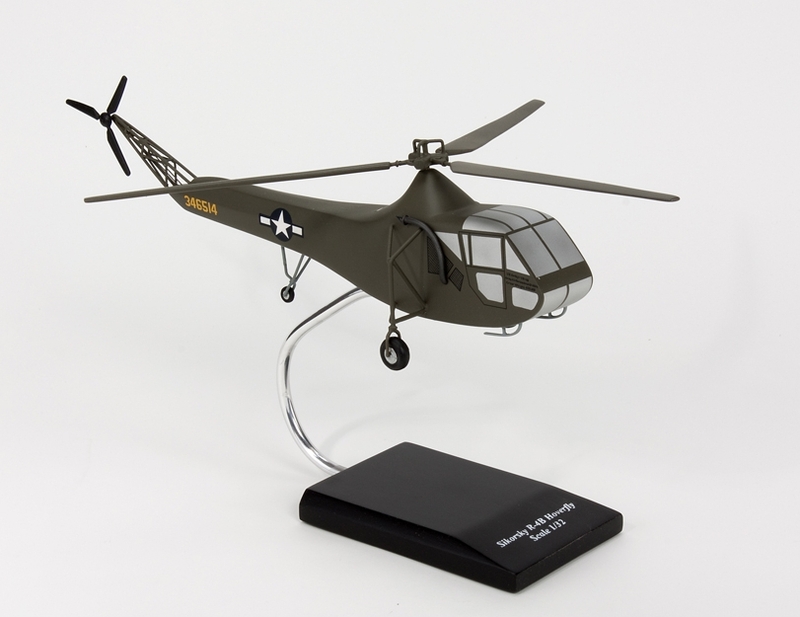 Length: 14 3/4" R/S: 11"
The R-4 was a two-place helicopter designed by Igor Sikorsky with a single, three-bladed main rotor and powered by a radial engine. The R-4 was the world's first large-scale mass-produced helicopter and the first helicopter to enter service with the United States Army Air Forces, Navy, and Coast Guard, as well as for the United Kingdom's Royal Air Force and Royal Navy. In Royal Air Force service, the R-4 was called the Hoverfly. In April 1944, U.S. Army Lieutenant Carter Harman of the 1st Air Commando Group conducted the first combat rescue by helicopter using a R-4 in the China-Burma-India theater. While the R-4 was being used for rescues in Burma and China, it was also being used to ferry parts between floating Aviation Repair Units in the South Pacific. When the helicopters were not being used to fly the parts from one location to another, they were enlisted for medical evacuation and other mercy missions.